Most folks remember to flush out water from their lines and/or replace it with antifreeze. 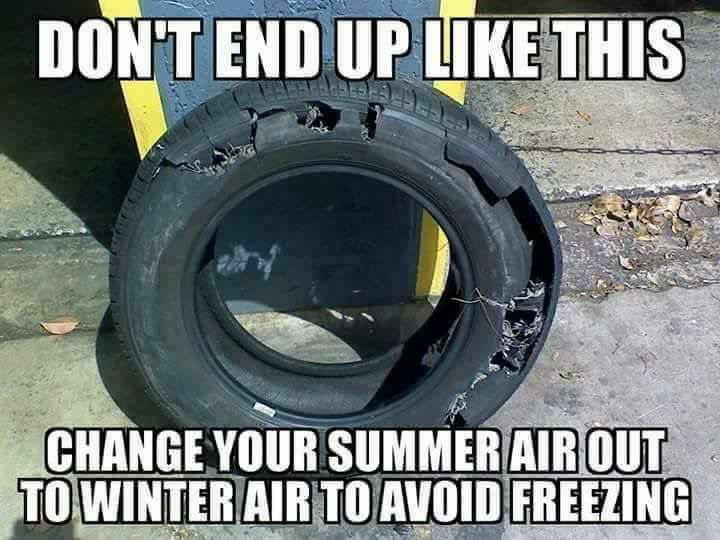 However, how many of you remember to winterize your tires by replacing the summer air with winter air? One of the least appreciated benefits of nitrogen filled tires. Since nitrogen freezes around -346 degrees Fahrenheit, you don’t need to worry about seasonal changes in your tire air composition. Have used nitrogen exclusively in my tires for the last three years any have not once experienced any damage as shown by the OP. But Forest River buys the tire/rims as a package. Depending on when they were aired up, they could have summer or winter air in them already. Tires are like thermos bottles. It keeps hot things hot, and cold things cold. The mystery is......How does it know? Upgraded to All-Season tires complete with All-Season air. I only use 5W/30 air in all my tires. Good for all seasons. Oh wait...I read it on the internet so it must be true...NOT! Have you tried the newer synthetic air? It lets you go longer between pressure checks. The sad thing about this thread is that some unsuspecting newbie is going to pick up on this and take it to heart as the gospel.